Farmington Elementary is pleased to announce its Annual Camp Kindergarten, to be held June 3rd-7th from 8:30-11:30 am at Farmington Elementary School. 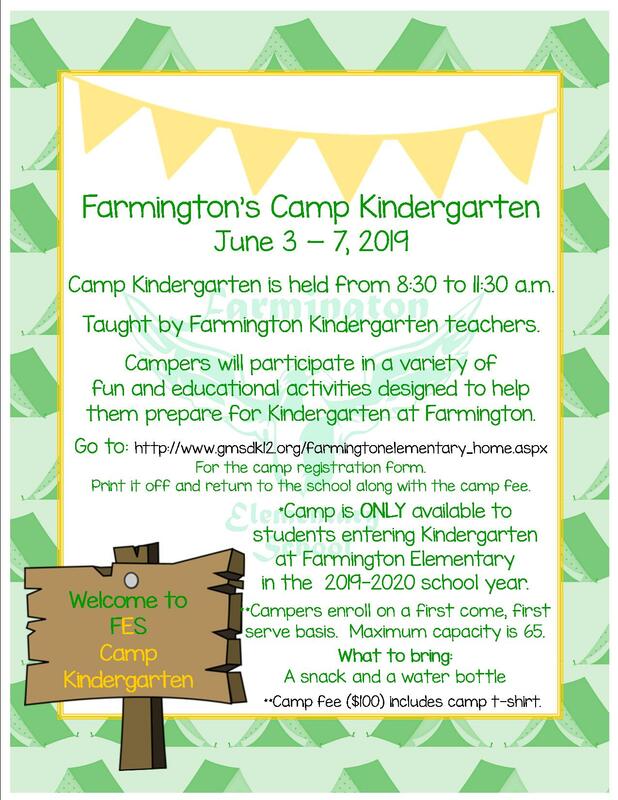 The camp, taught by Farmington Kindergarten teachers, is open to students entering Kindergarten at Farmington Elementary in the 2019-2020 school year. Campers will participate in a variety of fun and educational activities designed to help them prepare for Kindergarten at Farmington. Campers enroll on a first come, first serve basis. Maximum capacity is 65. There is a camp fee of $100, which includes a daily snack and a camp t-shirt. *Please print the Registration Form, and return the form and camp fee to the school. Click here for the Kindergarten Camp Flyer.